You are half right. I think Spore Plent is down but the picture is off of Spore Wiki. It's a little big, LoL. I had to think about it for a while about how the Quillarian would fit in, It just makes it funny. I also had to make up a new instrument for the Kazean being that a floor mounted instrument seemed unconventional. looks great, u sure put alot of effort into this. Thanks. I'm gonna color it in a cel shade style like my avatar. It will take a while. Durring the Rocket Age the River, Desert and Grassland tribes claimed parts of Sirenia while the Cave and Mountain Tribes claimed parts of Sina. Durring this time the first off world battles occur over territory. Durring this time many strange low gravity war machines are developed. Eventually after the land rush and skirmishes the territories are established in the configurations shown. On Sierenia Blue is River Tribe, Orange Grassland Tribe and Yellow Desert Tribe. On Sina Light Blue is Mountain Tribe and Cave Tribe. Each tribe mines for minerals and develop mostly underground moon bases. Also due to the low gravity and lack of environment industry booms. They can lift very heavy loads cheaply as well as not having to worry about hurting the environment, which becomes a concern during the Modern Age. Sleeping since I hit the physical limits of 600 mhz that can not render woods on a planet in any way. raytraced shadows with alpha layer tricks or shadow maps without alpha layer and more polygons, both fail on that large scales. Like in Humans, Naucean too have genetic disorders. Like humans can have tails or webbed hands Nauceans have genetic disorders based on their evolutionary history. 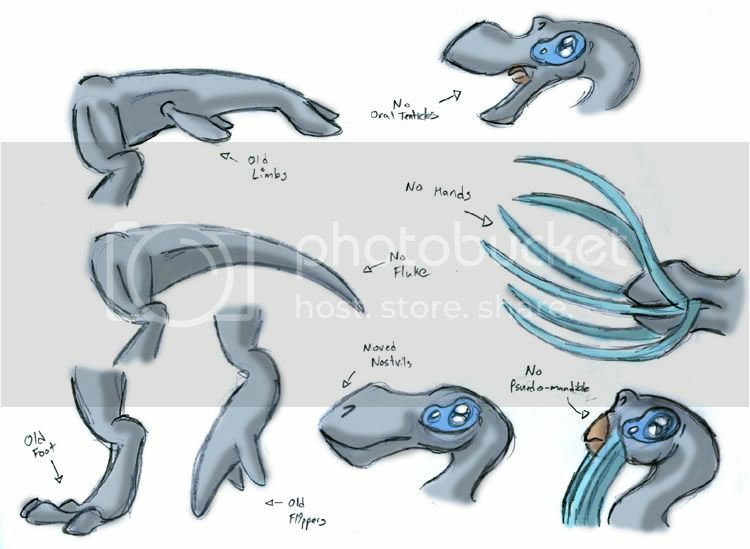 Before their aquatic stage they use to have 4 limbs like most other creatures on Nauceanica, but over time they got smaller and disappeared, but some times Nauceans are born with them or even without tail flukes from their land ancestors. In the same way they may have visable fingers and toes on their floots like their land ancestors had. On the head they can have nostrils on the tip of the nose like their land ancestors or even no pseudo-mandible, no hands on the oral tentacles or even none at all like their long ago fish ancestors were. There is a multitude of these disorders as well as many other disorders, just like humans have. Everything from conjoined twins, gigantism, dwarfism, albinoism, deafness, blindness, mute, born without limbs, etc. They are biological creatures and are susceptible to these diseases. Durring the Biotech age many of these were cured or avoided with genetic manipulation before babies were born. This was a good thing because fanatical religions like worshipers of Au would believe these people were demons and would kill them even if they were born into the Desert tribe. The other tribes were much more tolerant and sympathetic to these Nauceans with disabilities. Cool! If I were a naucean I wouldn't mind moved nostrils or no hands.